Creative Pomeranian Haircuts and Care! » Creative Pomeranian Haircuts and Care! Before we talk about Pomeranian hairsytles. How much did you know about this lovely breed of dog? Pomeranians are treasured all over the world. Despite their size, they still manage to be alert, obedient and active almost all the time compared to other dog breeds. Did you know that Pomeranians are considered a sign of royalty (source)? Pomeranians were always a favourite of England’s Queen, Victoria. 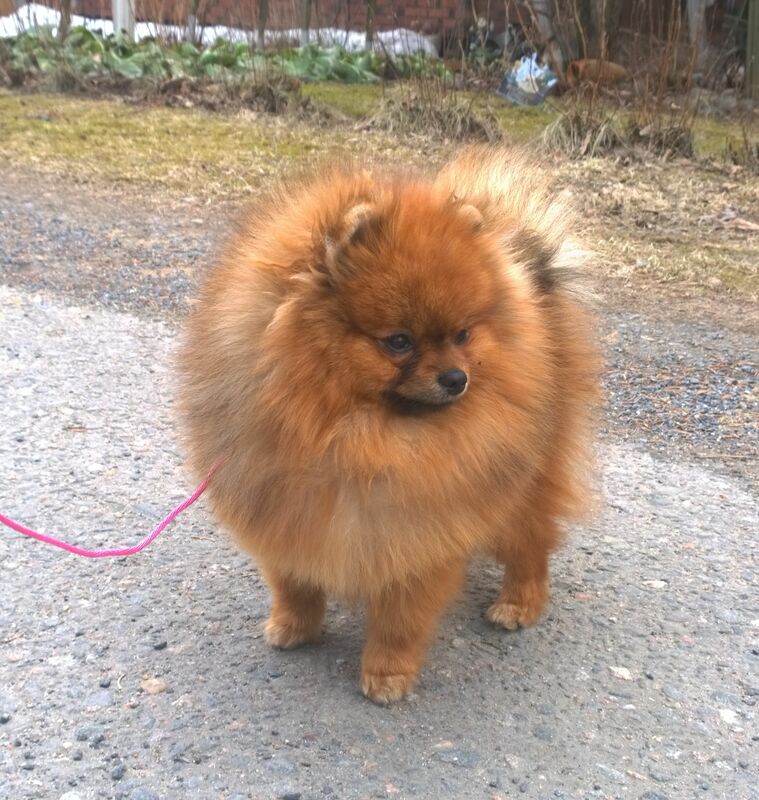 Poms usually weigh an average of 3 to 7 pounds. Their magnificent coat is their signature characteristic that we identify them with. They have a soft double coat which is indisputably the Pomeranian’s crowning glory. They come in a variety of complexions, orange and red colours being among the favourite. Dog owners especially those of Pomeranian dogs love to cut and trim their dog’s fur to maintain their adorable look. There are a range of haircuts to choose from but the lion and the kennel cuts are the best known haircuts suitable for them. However, there are factors to consider before the haircut - if you really want to bring out the best out of it. Jump straight to Pomeranian Haircuts if you are in a hurry! Just like humans, short hair is easy to groom; the same applies to dog’s fur. Most dog owners decide to cut their Pomeranian's fur so that it's easy to clean and manage. Besides that, it can be quite irritating when your Pomeranian leaves traces of its fur on places such as the carpet, seats or mats in the house. Therefore, short fur will reduce the shedding. Also, a suitable haircut will reduce the chances of debris sticking on them. Some dog owners believe that shorter fur allow the Pomeranian to cool off in the summertime; which is not a proven fact (source). Your Poms might feel the discomfort when their fur is being trimmed. Did you know you that there are hacks that you could apply to make the work easier for the groomer? If you ever have taken a dog to the groomer, you will notice that they tend to get irritated when their paws are touched. It's because they are not used to being touched. As its owner, try training your Pom to get used to being held by strangers as early as a pup. This will ease the work of the groomer. Puppies can adapt to grooming process more easily compared to an adult pooch. Don’t be so sure that your puppy doesn’t need a haircut. Nail trimming is a form of grooming after all. Matted fur in dogs prolongs the haircutting time. Worse still, it could cost you more than an "ordinary" haircut. As a simple solution, constant brushing will reduce knots and make grooming a Pom easier. Try to keep this haircutting process as simple and stress-free as possible. If you intend to take your Pom to a groomer, it's best to properly introduce them and the place to your pet before the appointment. You know your pet's behaviors and personalities the best, of course. Some of them don't really need this introductory phase. For me, I need to make sure my Kyra is not overly excited, rather than stressed or anxious. Bring a Pomeranian haircut picture to show the groomer the specific haircut ​you want for your Pom. This can make work lighter and quicker while minimizing disappointment and argument. 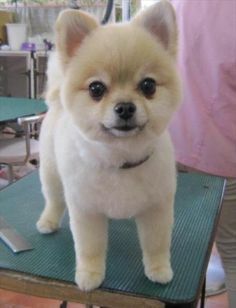 Search the internet for Pomeranian haircut pictures or buy dog grooming magazines to get your desired Pomeranian haircut. Washing will always make the groomer’s work easier. However, it's best to discuss with them whether or not to wash your Pom prior to the haircut. It's not unlikely that your groomer might shower it after the cut. As much as we know most dogs like (like is an understatement) water; but as a responsible owner, we must avoid constantly showering them. Matting is especially common to dogs with long fur. It can be avoided by removing excessive hair during the shedding period. Try maintaining well-trimmed fur to reduce the chances of matting. Now, let's look at some of the cool (or popular) Pomeranian haircuts! Due to Pomeranian's long fur, there are many hairstyles that groomers can come up with; some are irresistible to look at. Which dog owners do not want to be proud of their own pet? As the name suggests, the fur resembles the mane of a lion. Fur is trimmed to the skin level and is only left from the neck area and chest creating a mane-like appearance. This Pomeranian haircut requires touching up once every two weeks to retain the shape. Of course, its tail should look like that of a lion, too. This kind of hair style has however raised concern - since the hair at the back of the dog is usually almost shaved to the skin level. You will need to consult your vet first before taking her for this haircut in order to avoid side effects that might come with it. All in all, a small domesticated lookalike lion is eye-catching to all Pomeranian dog lovers. The word ‘kennel’ was coined from keeping hunting dogs on a leash during off seasons. Kennel haircuts are common among the professional show dogs. This kind of cut keeps the dog’s fur short and neat, therefore, less demanding when it comes to daily brushing and management. The length of this cut majorly depends on the owner’s desires. It’s always recommendable to start with an equally longer look since you can easily adjust to a shorter one when necessary. This is an ideal and fashionable look that will make your dog look attractive. You simply cut the fur at the back part of its body, so that it's short enough, while leaving out the fur on its face as well as the front part and paws. As the name suggests, you shave one half of the body leaving the other half fully overgrown. You like it cool and classy? Search no more, this might be suitable for you. The cut is considered by most dog owners as an ideal Pomeranian grooming style, because of its glamorous outlook. The fur is trimmed in a trendy way to portray a spherical shape on the dog’s body. For distinction, the hair on the paws is clean-shaven. To pull out that foxy look, you need to pay more attention to the fur on the tail. We can call it the white foxy with a tail. You’re required to let the fur on the dog’s tail to grow long enough. However, to maintain this look, extra grooming effort is required. This is because the tail collects all kinds of debris which if doesn’t receive daily brushing and washing will accumulate dirt. This is exactly the haircut you are looking for if you would like your favourite pet to pull out that teddy bear look. What you need to do is to trim the fur short enough until it attains that soft and fluffy texture. Be keen to give it that adorable rounded face by keeping the hair on the face a little longer than the rest of the body. The length of the fur depends on the owner’s preference. What you’ll have after following these simple hacks is a live teddy bear! This happens to be the most manageable hair cut for Pomeranians. The entire dog’s coat is shaved off. There are specific situations that require the owner to take this specific one. Especially when the coat is unusually tangled due to neglected grooming which may cause pain to the dog during brushing. In other cases, this option can be perfect if your female Pomeranian is pregnant to simplify the grooming work. The clean shave works for the low budget owners or those who might be too engaged in personal matters to get time to groom their pet to expectation. All in all, this kind of shave might be inconvenient for Pomeranians since they are descendants of cold weather snow dogs. You want your groomer to actualize a pixie-like Pomeranian haircut for your doggy? This is a short hairstyle generally short on the back and sides of the head and slightly longer on the top. The fur on the head is shaped in to the pixie appearance while the fur on the rest of the body is kept short for distinction. Haircuts for Pomeranians come in diversity. You just need to choose the right one. For the spiky style it’s not a walk in the park. This particular one needs a lot of attention and commitment. The hair is needed to be short enough not to look messy but long enough to stick up and curl up at the edges to exhibit that amazing appearance. This is one unique Pomeranian grooming style. It’s not so popular among the dog owners but has been embraced by a few after all. The Pom is a little thing that’s full of spirit, if it would be human it would definitely go for this particular cut itself. The groomer trims the fur on the sides leaving a long and fluffy centre from neck towards than tail. It doesn’t hurt to try out new things. Trust me this one will be worth your time and money. Pomeranian short haircuts usually come with a lot of risks. The coat of the Pomeranian dog can easily be cut or clipped during shaving. This can cause very serious skin rashes to the dog. It is, therefore, advisable to choose a groomer that has a lot of experience in the field with positive reviews. Have you ever heard of post clipping Alopecia? It is a condition caused by cutting of the hair follicles which in turn causes the hair not to grow back for at least 6 months. When considering a haircut for Pomeranian dog, be careful to choose a haircut that would not lead to skin damage or Alopecia. This can be avoided by making sure that there is enough hair on the dog’s skin whenever you go for grooming. Sunburns and skin infections are also a risk when short haircuts are involved. The idea that short hair is good for your Poms during summertime might not be a good idea since there is a higher risk of sunburns. The fact that there is less hair on your dog’s coat may also expose her to skin infections. By now, you’ve learnt about all the popular haircuts, ways to prepare for grooming and the possible risks involved. It is possible to avoid all these risks above by simply consulting your vet and looking for a groomer with experience and knows what he is doing. Start searching for haircuts and a groomer and take your adorable Pom for a hairdo! Fernandez, A. (2011). Pomeranian. Freehold, N.J.: Kennel Club Books. Kennels, N. (2018). Blog. New Mexican Kennels. Perreault, J. (2018). 10 Things Your Dog Groomer Wishes You Knew. Petful.